So, someone has deleted an Exchange 2003 mailbox. Instead of trying to find out who did the evil deed, my advice is to concentrate on the solution and head for the Mailbox Recovery Center. You will find that Recovery Center is geared to fast restores with minimum downtime. By default you have 30 days to recover a user’s mailbox using the technique I am about to explain. After 30 days the tombstone effect kicks in and Exchange 2003 deletes the mailbox. What this means is that when the tombstone lifetime expires, then you have to recover to an Alternative Forest. On the other hand, if it’s just a few emails that a user has recently deleted, then explain to them how to find the Deleted Item Recovery from Outlook. (Tools menu). If, or should I say when, someone accidentally deletes a mailbox, go to Exchange 2003’s Mailbox Recovery Center. This is a new utility which you will find it in the Exchange System Manager, under the Tools Folder. 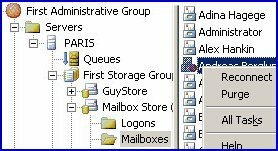 A big improvement in Exchange 2003, is the ability to restore multiple mailboxes simultaneously. All that the Mailbox Recovery Center wizard needs to know, is the name of the mailbox store. If you are not sure what the mailstore is called, just type the first two letters and the wizard will most likely display the store name. Once the wizard finds the deleted mailbox with its red cross, you are ready to reconnect it to the original Active Directory user. If that original account has been deleted, then you can create a new user without a mailbox, and simply attach the old mailbox to the new user. Just to stress that new user would be a mail-enabled user not a mailbox enabled user. The main problem with the Recovery Center is latency. This frustration is most acute in testing or if you have just this minute deleted a mailbox. It can take up to 15 minutes for the Mailbox Recovery Center to become aware of a newly deleted mailbox. Refresh helps, but only if you click on the Mailbox Recovery Center folder in the left pane. As an alternative to the Mailbox Recovery Center, you can go directly to the Mailbox Store and seek out mailboxes with a red cross. When you right-click on the account you will see Reconnect on the short cut menu. Once again, you have the choice of reconnecting the mailbox with its previous owner, or creating a brand new account without a mailbox. The Mailbox Recovery Center is your salvation for that moment when you realize that someone has deleted a mailbox. Nobody ever owns up to deleting users or their mailboxes, but you do not care, because you now have the solution to reconnect and view the email. If you cannot find the deleted mailbox, call for the Cleanup Agent.